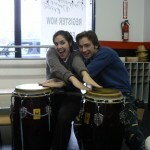 The Indy Convergence provides 90-120 minute workshops for students of all ages in many areas of the arts. The workshops are tailored to meet the needs of each specific group. Recommended for community based theaters working on a new project, dance companies embarking on inter-disciplinary work, and any performing arts students. Spend a day in the life of an Indy Convergence participant. 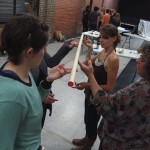 These one day workshops will highlight the unique style of collaborative performance creation The Indy Convergence has developed. Participants will take a morning movement class, 2 workshops taught by former participants and work with The Indy Convergence Artistic Director, Robert Negron, to create a shortened version of an “Umbrella Project”- a wholly collaborative project where the talents of each participant is called upon to create a cohesive, thoughtful story or idea. Three projects will be chosen to be mini-indy projects. 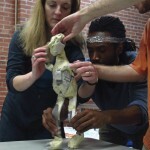 Each project leader will use the talents and skills of the participants to focus on one part of their artistic process. The goal of this “mini-indy” is for artists to give themselves the permission to start a new project or process without fear of failure. By embracing the idea of “say yes” the jitters, bad ideas, long-winded explanations disappear allowing you, the artist, to focus on the core of your work and what you want to share with an audience. Take part in the final informal showing of work created in an Open Lab Performance. This all inclusive package is built with the hosts to best manage resources and impact. Contact us at the Indy Convergence to discuss how we can create a convergence around your needs for your artistic community. Why work with the Indy Convergence? The Indy Convergence has a unique way of bringing people out of their comfort zones without putting them on the spot. Let us help your office or team bond in a no-fail, go for broke 90 minute workshop. The Indy Convergence will lead each group in an accessible warm-up and theater exercises that encourage the participants to work together and imagine beyond the cubicle. No awkward trust falls needed- these workshops will help your office or creative team trust the instincts of their co-workers and become a more cohesive group in the workplace. 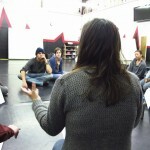 The Indy Convergence can provide workshops in acting, improvisation, collaboration and choreography. Working together with your dance studio, The Indy Convergence will develop classes that suit the needs of your students. These workshops are sure to spark the imagination of your students, improve their performance skills and create well-rounded, thoughtful artists with a fresh perspective on the fusion of dance and theater. Are you Non-Profit or a Social Business? We make special accommodations for non-profit, charitable organizations. We work with US-based 501(c)3, L3C, B Corporation, fiscally sponsored and internationally equivalent organizations to make the convergence model for workshop and creative development more easily attainable. Contact us for more information.